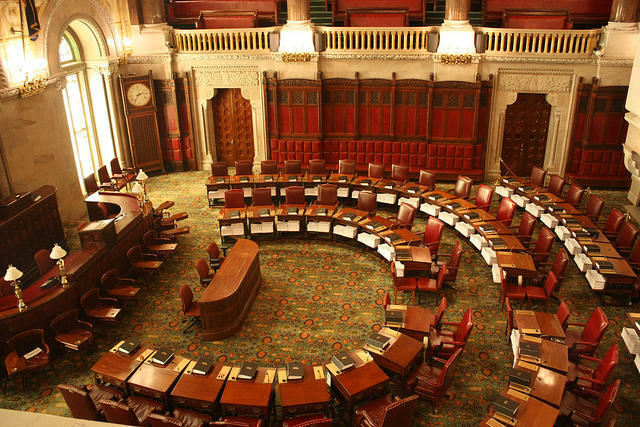 ALBANY, NY (WSKG) – The New York State Senate is experiencing its worst gridlock in nine years, with the two major factions tied at 31 members each. No legislation is moving through the chamber, but there’s lots of finger-pointing. Tempers flared on the Senate floor as Democrat Michael Gianaris blamed the GOP for the stalemate. “They don’t have the votes to pass a single thing in this chamber,” Gianaris shouted. After two days of infighting, Senate Majority Leader John Flanagan was frustrated. “We saw the Democrats paying shameless games with people’s lives,” he said. And Lt. Gov. Kathy Hochul, whose duties include presiding over the chamber, was annoyed. “The governor and I are offended by the actions taken here today in the Senate,” Hochul said. The current trouble started when Sen. Tom Croci, a Republican, decided to not seek re-election and rejoin the military. He apparently already has left for active duty. The GOP still has 32 seats, but with Croci gone, it has just 31 votes, one short of the numerical majority of 32 needed to pass legislation. Democrats also have 31 senators in their conference, so the Senate is tied. On Wednesday, Democrats hoped to attach a hostile amendment to one of the bills. The amendment would force a vote on the women’s reproductive health act, which codifies into New York law the abortion rights protections in the 1973 U.S. Supreme Court decision Roe v. Wade. An accompanying measure would make birth control more accessible. But Deputy Senate Leader John DeFrancisco abruptly shut down business and pulled all the bills for the day when he saw Hochul enter the chamber. “Would you lay the entire calendar aside for the day?” DeFrancisco asked. His request was granted by the Republican senator who was already at the podium, Joe Griffo. Hochul was there to try to cast the 32nd vote to allow the amendment to come to the floor for a vote. The lieutenant governor cannot vote directly on legislation, but does have the ability, under the state’s constitution, to vote on a procedural matter, like whether an amendment is considered germane or not. Hochul also threatened to make it a campaign issue if there’s not a vote on the abortion rights measure. Flanagan said while Hochul has the right to preside at the podium, she does not have the constitutional right to cast any votes. He said there was no need for Hochul to preside over the Senate because the GOP is already running the Senate according to the established rules. And he hinted that the Democrats, who hope to win more seats in November, are not quite ready to take over the chamber. On Thursday, the GOP did put a bill on the floor that would enact protections against concussions for schoolchildren involved in sports. But Democrats objected, saying that the GOP had broken protocol and that they had not been informed about the legislation in advance. All of the Democrats voted no, meaning the vote was tied and the bill could not pass. The no votes incensed the bill’s sponsor, Sen. Michael Ranzenhofer. “How can you look into the mom’s eyes and say, ‘I just don’t care about your kid, and that’s why I voted no,’” Ranzenhofer said. The leader of the Senate Democrats, Andrea Stewart-Cousins, denies that the Democrats are essentially going on strike by voting no on Thursday’s measure. She said if anyone is at fault, it’s the Republicans for not allowing the hostile amendment to be voted on. “Today was shameless because, quite frankly, it broke all the norms,” Stewart-Cousins said. Stewart-Cousins said her members are willing to work with the Republicans on future legislation, but she could not say when the stalemate might end.